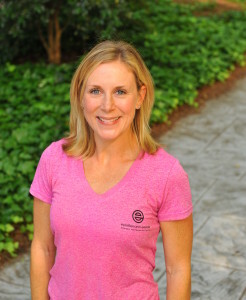 Julie Jones brings a diverse background to Excellence in Exercise with a Bachelor of Art Degree in Music and Master of Art Degree in Communication , specializing in Advertising & Public Relations, both from the University of Alabama; and a Master of Music Degree in Voice Performance from the University of Texas at Austin. Julie manages the marketing and communication initiatives for Excellence in Exercise and works with corporate partners to provide quality programming and special events. Julie is also a Certified Personal Trainer through the American Council on Exercise (ACE), a Certified Yoga Instructor, and CPR&AED certified. Julie’s Philosophy: Smile, breathe, and don’t be afraid to take on a new challenge, whether it’s in the gym, in the yoga studio, or in your everyday life.